After a disappointing lack of action at the trading deadline and waiver deadline, the Phillies maintained essentially the same team to begin and end the month of August, with only Robert Hernandez and John Mayberry getting traded. On the bright side, the Phillies had their first winning month of the season. Drafted by the Rangers in 2005, Mayberry was Ruben Amaro's first acuisition as GM at the end of 2008. Ben Revere had a .316 batting average on September 5 and led the National League in hitting. It's hard to imagine that a player contending for the batting title would be benched, but that is exactly what happened to Ben Revere...twice. Revere did not start for five straight games from May 16-21 and only started 3 of 8 games from July 19-26. Revere led the league in batting on Sep 5 and was also third in steals (42), but only had 21 extra-base hits. He had the lowest walk rate (2.1%) of all qualifying batters in baseball, but his .333 OBP still ranked 39th in the league at the time. He may be an extreme and unique example, but his combination of high on-base percentage, speed, and a lack of power is not atypical of many leadoff hitters. Hitters generally can be separated into two categories: run creators and run producers. Run creators get on base and run producers drive them in. While run producers deservedly get plenty of attention (and money), run creators? Not so much. As I mentioned in my last post, speed and the ability to reach base have a definite impact on winning baseball games, yet the speed portion receives very little love statistically. Outside of the crazy sabermetric stats with secret formulas, the only stat measuring speed is stolen bases. I wanted a way to account for speed and did so in a new statistical measure I call Total Base Percentage which includes slugging percentage, on-base percentage, and steals in one stat. Here is the formula: Total Bases + walks + hit-by-pitches + stolen bases – caught stealing divided by plate appearances. Today's game will wrap up Ryne Sandberg's first season as Phillies' manager. While his first campaign was in no way a huge success, it also was not an unmitigated disaster, either. 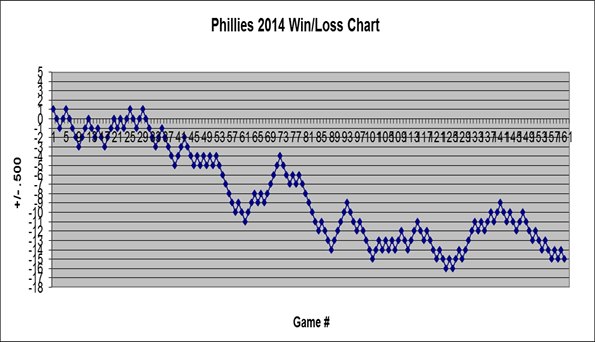 I will touch on this in more depth over the six months which constitute the Phillies' offseason, but for now I think the Phillies win/loss graph tells Sandberg's story just as well. The word which comes to mind with this graph is "tired." Tired especially works for an old team that set a major league record with four players age 34 or older (Howard, Utley, Rollins, Byrd) amassing 600 plate appearances. It shows a team that tried to hang in there and just ran out of steam. Just by looking at this chart, I would have to say Sandberg did not make much of an impact in a positive or negative way. We can't say the Phillies played their best baseball down the stretch like nearly every Charlie Manual team, but they also did not collapse during the final meaningless months. Of course, if the Phillies lose today's game, they will finish 16-games below .500, which would match their low point for the entire season.